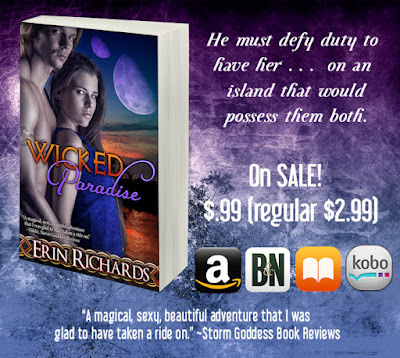 My fantasy romance novel, Wicked Paradise is on sale for $.99 (regular price $2.99) on Amazon. If you like sorcery and time-travel in a unique fantasy setting, then don't miss out on this deal! Sorceress Morgan of medieval Avalon and Ryan, a modern-day Druid assassin, time-travel to a mystical island to destroy a demon bent on annihilating survivors of the apocalyptic 21st century. As Morgan resists a fierce and lethal bond to Ryan, she has no choice but to kill the demon before it kills her. Yet Ryan has other plans for the evil Fomorian…even when Morgan stirs in him a hunger that puts his life’s purpose at risk. A skittering awareness on her backside sent her pulses racing again. Ryan’s fingertips caressed her back, his hands angling toward her hips. Automatically, she curved tighter into his body. Security and warmth tinged with heart stopping desire cloaked her. “Morgan,” he whispered against her hair. “It’s all right now. We’re safe.” He touched her almost reverently, disproving his earlier suspicion. She had the wildest urge to touch every inch of his bare skin. Something she’d never done to any man, nor ever wanted to until Ryan appeared in her dreams. Heat suffused her face and she fought the inappropriate and poorly timed urge. Instead, burning with need, she lifted her head and touched her lips to his full, warm mouth experimentally, something she’d wished to do since the moment he became real. He responded, pressing his lips to hers, first softly, then demanding, forcing her lips apart. She rested her hands on his wide shoulders. He made a harsh sound in his throat and slanted his head, the tip of his tongue breaching her parted lips, his lips soft yet firm on hers. Quivers started at the base of her spine and raced along her nerves. She opened her mouth wider and his tongue darted in. Her tongue met his, caressed it, tasted the lingering pineapple he’d snacked on earlier. Ryan poured himself into the kiss as if starved, and her own hunger liquefied her entire being. His ice melted into the warm pool her body had become. Desperate for air, she freed her mouth and drew a shaky breath. Ryan’s hand slipped down her arm, until his fingers brushed the side of her breast, not taking extra liberties. The heat of his fire magic burned through her muscles and bones. She smothered a moan, aching for him. Craving a love so long denied her. He kissed the curve of her neck, worked tiny kisses up to her ear, leaving a path of fire where his lips devoured her flesh, his harsh breath fanning the flames. The roughness of his whiskered jaw rasped along her skin. He nibbled her bottom lip, ran his tongue over her lips, until she parted her mouth. Again, he accepted her invitation and speared his tongue inside. Hypnotized by his kiss, her lips tingled, her mind clouded. Their tongues danced in an everlasting waltz. Excitement poured over his sweat glistened face. But doubt flashed behind his need and his massaging hands on her back froze. His eyes had gone wild, like a stormy midnight sky. Morgan wanted to rip off her tunic and rub her moistened skin against Ryan’s slick body, anything to keep the contact of skin on skin. Passion spiraled through her, melting her magic into molten drops. Finally, he tore his mouth off hers, and she fell into his wide, sharp eyes. "Holy mother of the Gods." He sucked in a sharp breath.